Announcing our 2013 Flower Girl Dress of the Year. This was a TERRIBLE year for me. Not only did I recently suffer the loss of my mother who helped me found my business, but recently, my father passed away to join her. For me, it just took me forever to want to look at other weddings and see brides dancing with their fathers. 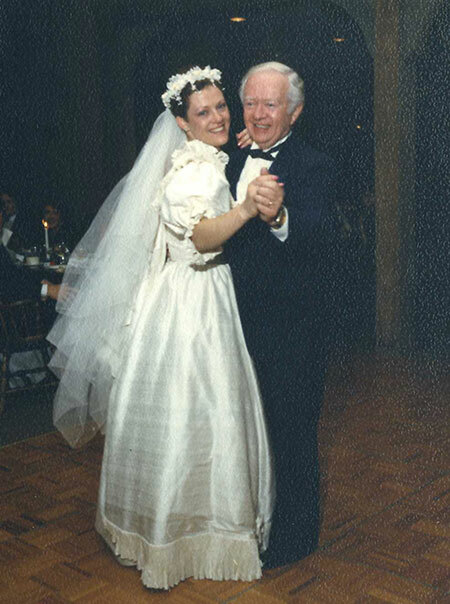 I think of the song by Luther Vandross, “One More Dance with my Father”, almost every day. So, it took me months to finish looking at the thousands of entries this year for our annual “Wedding of the Year” celebration. That said however, I already apologized in January, so without any less fanfare, this year is rather special. Not only did we pick TWO winners and a Runner-Up, but our weddings are World-Wide: we have winners from Australia, Canada, and the United States. Over the next few days, we will write a little about each one. Today however, I want to share the photos and story of Alyssa and Leigh who held their wedding in Australia after a chance meeting in London. When I received the photography by David Fowler, Victoria we were really impressed. It is not often that we see photos from an area that we get to see such vistas. This wedding was truly one of them. 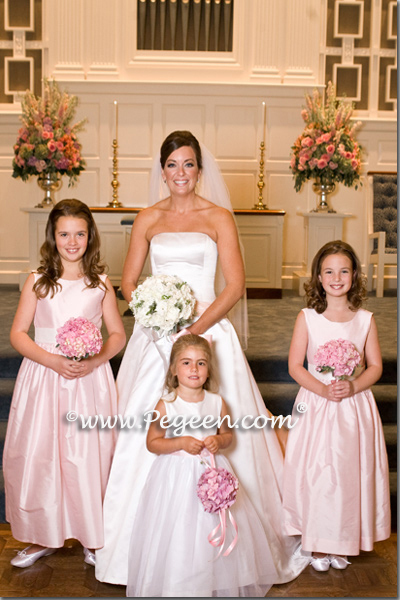 The gowns she chose for her flower girl dresses was style 402 with our Pegeen Signature Bustle. Since it was an afternoon wedding, Alyssa also chose to do our Audrey Hepburn length (tea length) skirt of tulle for the flower girl dress. Alyssa’s story of her chance meeting with Leigh, and how after the bus started to pull away was one we as romantics always hope for: that the guy is on the other side of the bus when it pulls away. After meeting at some friends, the fellow Aussie’s hit it off beautifully and enjoyed their meeting. As Alyssa walked Leigh over to the bus stop to say goodbye, we are sure she wondered why she had let him leave! However, Leigh boarded the bus for home. After paying his fare, he dramatically told the driver to “stop” so he could once again disembark. When the bus pulled away, imagine Alyssa’s surprise and joy that on the other side of the bus stood Leigh waiting! SIGH. So for their wedding, they tied the theme into the many places in their past while in London. To read this “tugs at your heartstrings” story, continue to our website and visit all the wonderful images as well. January 14, 2013 / FEATURED FLOWER GIRL DRESSES, Purple Themed Weddings, Tulle Flower Girl Dresses, Wedding of the Month / Comments Off on Embarrassing, isn’t it? 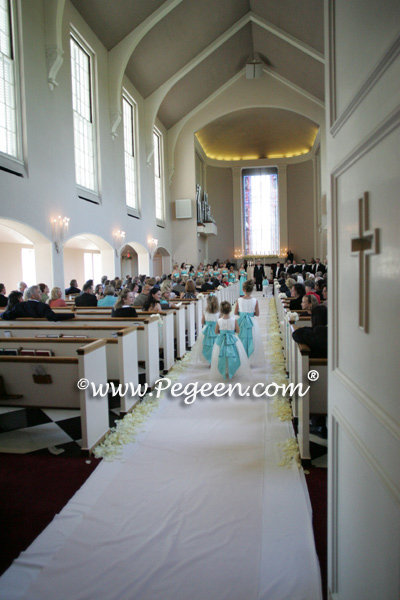 Her dress was style 402 from the Pegeen Flower Girl Couture Collection with just a simple standard sash and trimmed with hydrangea flowers. 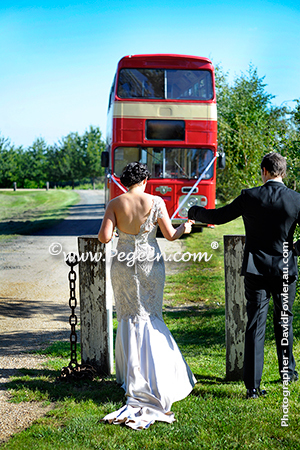 In just about five or six weeks, we will select our Wedding of the Year for 2013 and so far, the weddings we have chosen have been spectacular. To find out about our contest, click details. 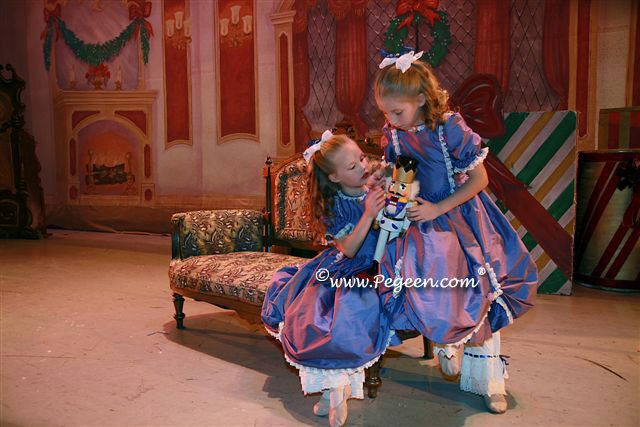 This month, we decided to highlight a very special event – as each October, mothers and dance directors alike start calling us to place their orders for their upcoming performance of the Nutcracker Ballet held around Christmas Time. Like our Wedding of the Year Flower Girl Dress that we featured in our 2012 Full page advertisements in bridal publications like Ceremony Magazine, Luxury Brides, Grace Ormond, and UK Cosmopolitan Brides, these dresses are going to be featured in our ads for various dance publications including Dance Magazine. We present to you our first “wedding” of the month for this year. On March 17th, in honor of our 30 years in business, we will announce our Newest Wedding of the Year for 2012 ! The anticipation is definitely growing and we are having so much FUN going over all of our customer’s DVDs, Videos and Bride’s Entries. 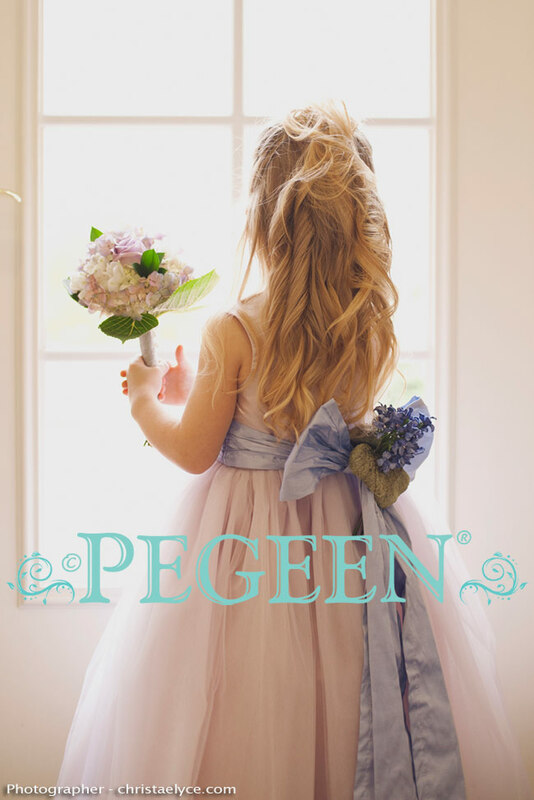 If you purchase a dress or suit from Pegeen.com, you are free to send in your photographs of the children dressed in Pegeen’s fashions and enter into our Model of the Year or Wedding of the Month contests. 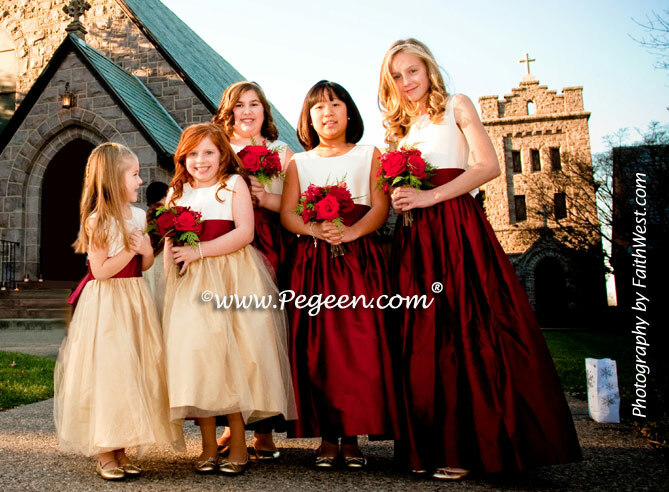 We choose our models from photographs submitted from those who have purchased dresses from Pegeen. Customer’s photos are highlighted throughout the website in our Real Weddings Gallery as well as other places around the site. If all the elements are right, these photographs may be chosen to be used in some of our advertising. This year we will be doing something slightly different for our Anniversary Celebration and because it is pretty hush-hush, we won’t make that announcement around March 17th or slightly before. A hint: it has to do with a VERY special “wedding” being held in December 1st 2012 at Disney – complete with Cinderella’s castle and I can’t wait to begin those announcements!